The Amish Buggy is High-Tech, Why Can’t Our Victoria’s Be The Same? I recently came across a very interesting article on Popular Mechanics about the Amish Buggy. The Amish (not Tripathi) are a group of traditionalist Christians who practically reject the use of electricity, telecommunications and automobiles. They use a traditional Horse and Buggy to travel. Amish family riding in a traditional Amish buggy in Lancaster County, Pennsylvania, USA. Image copyright TheCadExpert, CC-BY-SA 3.0 Unported, available on the Commons. Why can’t our Victoria carriages be similar? 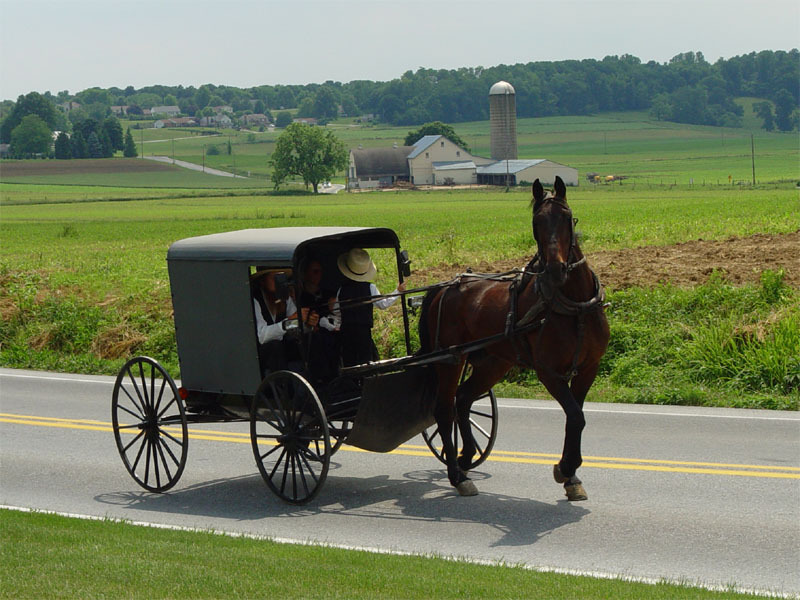 The Amish Buggy uses drum or disk brakes, that are similar to modern automobiles but not powered. There is a brake pedal that is connected to this, mainly to prevent the buggy from hitting the horse. Since states such as Ohio and Pennsylvania require vehicles to have lights, some buggies come with a dashboard of switches for brake lights, external lights, headlamps, turn indicators, et al, most of which are LEDs. They use a 20V/6A battery that usually powers an electric drill. Back home in India, nobody gives two hoots about lights and indicators. The Body of the buggy is quite interesting. These days, they’re made of fibreglass. Yes, that’s right, fibreglass. Aluminium components are also used, while the whole thing is coating with white oak or ash wood with fabric and polyester donning the upholstery. Modern buggies also use Thermally Modified Wood, which is basially wood that is dried up and then “baked” to take the moisture completely out of it. This gives it a long life and makes it difficult to rot. The buggies normally use either Steel or Solid Rubber tyres, with Steel being preferred since it isn’t compressible like rubber which is quieter. Those with Rubber tyres, have rear mounted brakes while those with Steel tyres have front mounted brakes. The wheel is made of Steel, Wood, Aluminium or Fibreglass. Yes, the Amish Buggy is quite an interesting thing, although it might seem silly to abstain from modern technology. I’d like to ride on one some day, but one only hopes that the Victorias in Bombay made some similar modifications. It would certainly spruce them up, even if they are being banned. Yes it does sound silly to not take the advantage of technology. But this was an interesting piece of information. Thanks for sharing Srikanth.